We believe that the Word of God was preserved in the Greek Textus Receptus and Hebrew Masoretic Text. We believe the King James version is the best translation for English speaking people and is the only Bible we as a church will utilize in the English language for all matters of faith and practice pertaining to the church. We believe there is only one true and living God. He is Infinite, Sovereign and Holy. He is the Creator and Ruler of Heaven and Earth. We believe that He is triune, that He is one God revealed in three persons. Each person is equal in power and authority but is distinct in His ministry. Each person of the trinity is no more or no less God in every aspect, and is each worthy of worship, trust, obedience, and praise. We believe that God the Father is the ultimate source of all things. He is the eternal Father, and that He had no beginning. He is the Father of all things in creation, therefore making all things responsible to Him. He is the Father of the individual only in salvation through Jesus Christ. 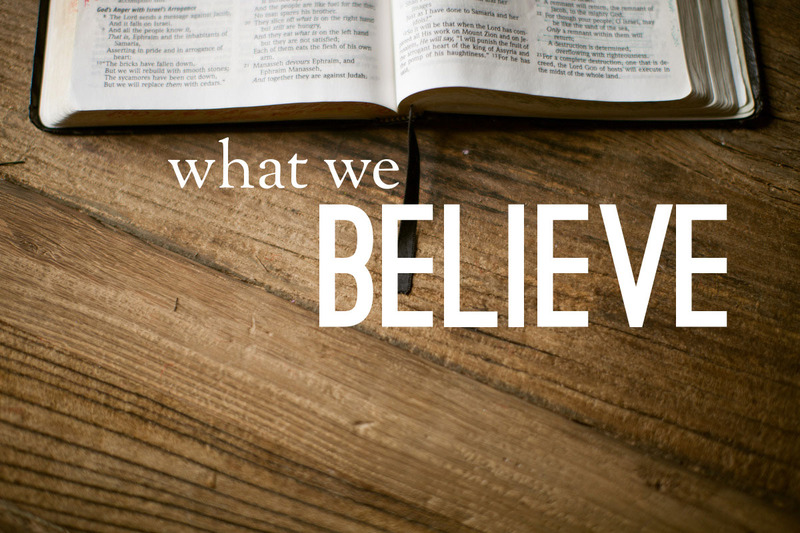 We believe that Jesus Christ is the only begotten Son of God. We believe that He is God, the very God. He is co-equal with the Father and the Holy Spirit. As God, He is Eternal, i.e. He never had a beginning. He became a man when He humbled Himself and was born to the virgin Mary after having been conceived by the Holy Spirit. While on the earth, Jesus was totally human and totally divine. He lived a sinless life and died a substitutionary death, was buried, and bodily arose from the grave the third day. He then revealed Himself to over 500 people after His resurrection. Following this, He bodily ascended into Heaven and is now fulfilling His intercessory ministry on the behalf of those who have believed in Him. We believe that the Holy Spirit is the third person of the Godhead, and is co-equal and co-eternal with the Father and the Son. The Holy Spirit’s ministry is that of One called to go along side and help. He was the One who inspired the writers of Scripture to write the very words of God. He dwells within all those who have received the Lord Jesus Christ as Savior. He is there to teach, comfort, and guide the Christian. He also is the One who brings conviction to the unsaved individual and draws him to Christ. His ministry in the world today is to exalt Jesus Christ. We believe the Scriptures teach that the Devil (or Satan) was a created spirit being of the highest order but through pride and a desire to be as the Almighty, sinned and drew after him a host of angels which fell with him. He is the prince and power of the air, the unholy god of this world, the great tempter, and the enemy of God. He is the accuser of the brethren, the lord of the antichrist, and the great deceiver of the world. He has already been defeated by Christ on the cross and is awaiting his final judgment in the lake of fire where he and his angels, and all those who reject Christ will spend eternity. We believe the Genesis account of creation literally. That man was created directly in God’s image and likeness. We believe that in six 24 hour days God created all things. We reject the theory of evolution, and any subsidiary theories that contradict the account given in Genesis. We believe the Scriptures teach that man was created in innocence under the law of his Creator, but by a deliberate act of disobedience man fell from his sinless state. As a result all men since the fall of Adam and Eve are born in sin, and are sinners by nature. As a result all men are under the judgment and condemnation of their sin. We believe the Scriptures teach that because man has sinned he is under sin’s condemnation, and is unable under his present state to enter into a right relationship with God. Jesus knowing the plight of mankind made a covenant with God the Father in eternity past, and came to this world, lived a sinless life, and sacrificed Himself on the cross, was buried, and rose again on the third day. By so doing He satisfies the requirements of God’s holiness, and paid the penalty for sin. Man now can enter into a right relationship with God by being “born again” through the finished work of Jesus. To be born again is to experience a spiritual re-birth by receiving Jesus Christ as personal Savior through repentance and faith. Repentance for salvation is changing one’s mind about God from unbelief to belief. Faith is simply believing what God said is true and accepting it as yours personally. At the time a person is born again he is instantaneously justified by God. To be justified is to be declared righteous by God. This takes place not by works of righteousness which man has done but solely through faith in Jesus Christ. We believe the Scriptures teach that sanctification is the divine setting apart of believers unto God: (1) an eternal act of God establishing believers in a position of holiness before Himself at the moment of salvation thus allowing the believer an entrance into heaven. (2) A life-long process in which believers are being conformed to the image of Christ as the Holy Spirit applies the Scriptures to their lives. (3) The completion of the process at the moment of the Lord’s return when all believers will be changed, and be made like Christ. We believe the Scriptures teach that all those who have been “born again” are saved by having received eternal life from God, who does not change, and are kept through the power of the triune God so they can never be lost. We believe that the church is the body of Christ and is made up of all true believers from Pentecost to the Rapture, having been established on the day of Pentecost it is visible in local assemblies around the world. The local church is God’s agent for world evangelism, fellowship, worship, ministry, and edification of believers. Christ is the head of the church and the pastor is the under-shepherd. A person is placed into the church at the time of salvation by the Holy Spirit, and is received into the local church by testimony of salvation and baptism. The church has two ordinances: baptism and the Lord’s Supper. The Scripture teaches that baptism is by immersion of believers into water by the authority of the local church to symbolize their faith in the crucified, buried, and risen Savior; and in the name of the Father, and the Son, and the Holy Spirit. The Scripture teaches that the Lord’s Supper is the commemoration of Christ’s death and should be preceded by careful self-examination. The church has three basic functions: exaltation of God, evangelization of the lost, and the edification of the believer. All members of the local church are responsible to be witnesses unto the saving knowledge of Christ, and for Him give the gospel to others. All members of the church are responsible to know and use their spiritual gifts so that the church will be edified. Spiritual gifts in Scripture are in two categories. Foundational gifts are those gifts that were given for the early days of the church with their purpose in confirming the message given by the Apostles until all revelation was completed. When all Scripture was completed there was no need for these gifts. Functional gift ministry gifts are those gifts that are given to every believer might have the ability to serve the Lord and be involved in the responsibility of edification given to the church. We believe the Scriptures teach that all the believers should be experientially separated from the world unto God; that believers are in the world but not of the world; that believers are not to love the world; and not to live like the world. We believe that the local church should be self-governing; and that it should never be directed, controlled, or governed by any outside source or institution. We believe that the church is God’s and can never be controlled by another source. We believe that it is Scriptural for Bible-believing churches to co-operate on a voluntary basis with other fundamental churches in contending for and the furtherance of the gospel. On all matters of doctrine, membership, policy government, and discipline the will of the local church as it agrees with Scripture will be final. We believe that the Scriptures teach of a literal heaven. A place of blessedness and joy to which the righteous go and live forever, consciously and physically enjoying God’s presence. We believe the Bible teaches Hell is a literal place. That it and that death are cast into the lake of fire. This is a place of unending torment to which those that have never come to Christ for salvation go and forever consciously and physically experience the wrath of God. Hell is a place of eternal fire, suffering and separation from God and all that is good. We believe the Bible teaches the literal imminent, pre-tribulation return of Jesus Christ to catch away His bride out of the world. At that time the dead in Christ shall be raised and living believers shall be transformed, receiving glorified bodies. The church shall be caught up to meet the Lord in the air, ever to be with Him. Christ with His church will come to the earth at the end of the Tribulation period and will destroy all those that have not accepted Christ in the battle of Armageddon. Christ and His church will then judge and rule on the earth for one thousand years. At the end of the thousand years, Satan will be allowed to go out and deceive the world one last time, after which the battle of Gog and Magog will be fought. Satan and all his followers will be judged and cast into the lake of fire forever. God will then destroy this earth and create a new heaven and a new earth for Him and His children to enjoy forever.